There are several golf courses in the planning and development stages. Two are open and others are coming along. We will post additional information here as it becomes available. An 18-hole, (Jack Nicklaus and Jack Nicklaus II co-design) championship course is situated on one of the most unique geographical locations in Mexico. The site consists of a 2 mile peninsula with a tidal estuary on one side, the Sea of Cortés on the other, and an inlet to the south. A challenging7,210 yard, 18 hole, par 72 sand dune course is a work of art surrounded by incomparable natural beauty hosting a wealth of flora and fauna. 9 ocean side holes make this course a Golfing experience beyond anyone’s expectations. will see on the course. Hole # 3 is the Nicklaus signature hole and will keep you guessing from tee to green. A blind shot off the tee box plays slightly uphill guarding the visual delight you will receive as you approach your ball for he second shot. Bring your A-game and keep the ball in play as the seaside foliage will grab your ball and hide it from you. Excellent greens and a challenging layout make this a fun course for low handicap players. Green Fees $120.00 USD with special rates for Mayan Palace members. If you are interested in chartering a boat we suggest you visit the Sun-N-Fun web site. Some local favorite spoons include: Acme Lures Slim Jim, Need-L-Eel, Kastmaster, and the Luhr Jensen Krocodile. Pompano, Corvina and Halibut hang out in sandy areas and around reefs, use smaller size spoons or squid. Good places to fish from shore include openings to estuaries and ports. You do not need a permit to fish from shore. The tides play a major role in fishing in Rocky Point. The best fishing from shore or close to shore is when the tide is either going in or going out and when the high and low tides fluctuate the most. You can view tide charts for the Rocky Point / Puerto Penasco area with this link tide charts. Tide charts provided by Tide Lines. For more serious fisherman charter boats with seasoned skippers and friendly crews are available. Half day trips fish between 3 and 6 miles out. Full day trips venture into deeper water and sometimes offer a better chance at larger fish such as this nice Pinta. On a full day trip you might jig spoons or bottom fish in 100 plus feet of water. Spring sport fishing may yield Grouper, Snapper and Bass. Dolphin Fish and Skipjack show up in the summer months starting in June. Other fish including Triggerfish and Sharks are caught throughout the year. Many of these species are caught weighing up to 150 pounds and more. Such fishing is a prized recreation for any fisherman. One of the landmarks of Puerto Peñasco is the Old Stone House, also known as the Hotel Peñasco. It’s on the left as you enter the Old Port, a large building constructed of gray stone blocks within a fenced enclosure. Legend has it that Al Capone used to stay there when he was fleeing from justice in the U.S.We met Jorge Seldner, who, with his brother, currently owns this historic building. It has been vacant for years, but now it has been renovated, and Jorge is renting rooms in it. He calls it Posada La Roca. Posada means hostel in Spanish.The Stone House was built with stone from the hill where the lighthouse is situated. It was cut by artisans into blocks almost uniform in size and shape. Their skill is evident when you compare the main part of the construction with three rooms that were added later, in which the blocks are all uneven in size and shape.The building has been in Jorge’s family since the late 30’s. It was at one time owned by a man named Stone, which is where it got its name. But perhaps because of its construction material, the name stuck. It was a haven for gangsters in 1928, but after Prohibition ended in 1933, it deteriorated rapidly. Legend has it that there was a big fire, started by Stone himself as part of an insurance fraud. Jorge’s grandmother bought the property in the late 30’s and made it into a hotel, the first in Puerto Peñasco. She died in 1981, leaving the property, which had been vacant for years, to Jorge and his brother Roberto. At the time Jorge was working in Hermosillo and Roberto in Nogales. After her death, they spent whatever time they could in Puerto Peñasco fixing up her house for sale; it is now a museum owned by Dr. Vasquez. Then in 1993 they turned their attention to the Stone House. Jorge commuted from Hermosillo at first, but in 1998 came to Puerto Peñasco to live permanently. He and his wife Eloisa have an apartment in the hotel. The main entrance to the hotel is to the east, facing the sea and the Malecon. There’s an enclosed porch that’s been added later, but the hotel’s main entrance leads into a spacious lobby with a fireplace and several comfortable chairs. The lobby takes up the entire width of the building. From there a hallway leads down the middle with rooms on either side–what’s called a shotgun design because you can fire a shotgun from the front door straight through to the back one. There are 11 rooms available, three with private baths. Common bathrooms are available for the other 8. The rooms with baths rent for $25 a night; the others for $20. Jorge and Eloisa have put in new plumbing and new electricity, and furnished the rooms attractively. When replacing the drainage, they found old clay pipes in perfect condition, handmade, 4″ in diameter with 1″ thick walls. Too late they found out that they wouldn’t have needed to replace them. We asked if they had saved any of them as antiques, but they said no. Other antique fixtures that they replaced were porcelain insulators for electricity. The original floors were concrete, and some of them are still visible, but the lobby and some of the bedrooms have tile floors put in by Jorge’s grandmother. The walls are thick and the ceilings high, both necessities before air conditioning was widespread. The central hallway has skylights overhead and clerestory windows above the roofs on both sides. This makes it very light. After completing the renovation, Jorge wants to restore the front entrance by tearing down the spurious porch and making a small yard with a wrought iron fence, the way it used to be. He also wants to install air conditioning and establish a little museum in the building with exhibits that illustrate its history. But the building is a museum already. Visit it to get a sense of Puerto Peñasco’s architectural past. Be sure to visit the CEDO. CEDO is an acronym for Intercultural Center for the Study of Deserts and Oceans, offering tours of gardens, outdoor adventures, nature hikes, and natural exhibits. Headquartered in Rocky Point,CEDO is dedicated to research, education, and conservation of the Northern Gulf area of Mexico. The center offers plenty of different ways to explore the turquoise-blue Sea of Cortezand the white sandy deserts of Rocky Point. If you’re on a family vacation, especially, the center offers a great place for you to explore the desert and sea that will open up a new experience for you and your kids. You’ll get a chance to see some the world’s finest tide pools, and try your hand at in scientific research. Bring your kids along for an exciting educational experience, or join an expert for an outdoor adventure that you won’t forget. Enjoy a bird or kayak tour in Estero Morúa. Take a hike through the Rocky Point area, paddle through channels of Estero Morúa in a kayak, or explore the underwater world of tide pools on a scuba dive. CEDO offers plenty of activities, and welcomes people of all ages to take part in hands-on learning. You and your family can learn more about the entire ecosystem from CEDO’s very knowledgeable staff through slide presentations, tours, talks, and walks through the desert sand. You can also schedule your own private tour if you like, and the center’s garden expedition and fin whale exhibit should prove to be very interesting. Spend an entire day browsing through the center, and then take a break by the swimming pool or the ocean—the choice is yours when you spend your next vacation in Rocky Point, Mexico. While there are many beaches in the Rocky Point area, the beach at Las Conchas is hard to beat. While the public has access, you’ll find that you have the beach and swimming all to yourself. 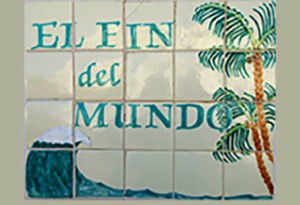 You’ll find great swimming just a few steps off El Fin del Mundo’s Veranda. Las Conchas beach on the Sea of Cortez has some of the warmest swimming waters in the world along with some bragging rights we’d like to share with you. After your swim, you might enjoy a short drive to the Estuary and the Oyster Farm. There you can order a cerveza and purchase fresh oysters served with a lime at 50 cents each. Enjoy the experience. Eat them to your hearts content. Rocky Point offers many fine shopping experiences. You’ll be amazed at the variety of goods that are available. From unique and beautiful Mexican pottery to exquisite traditional or classic European jewelry you won’t be disappointed. Below are listed a few shops and shop locations you will want to visit.